What Are The Uses Of Estramustine? 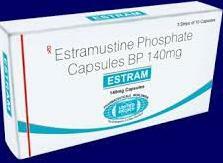 Estramustine is a synthetic steroidal estrogen used in the treatment of prostate cancer. It works by increasing estrogens in the body. What Are The Side Effects Of Estramustine? What Are The Contraindications Of Estramustine? Hypersensitivity towards the drug estramustine or any other allergies.